After Miss ACE discussed the various zombie types I thought it appropriate to do a bit of a line up. 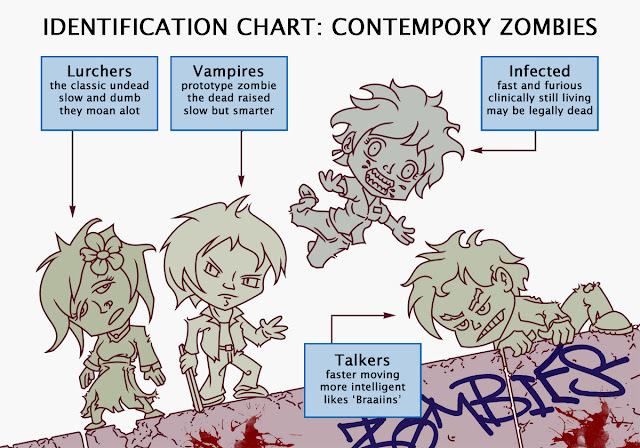 You got the three classes of zombies inspired by the movies. The classic slow dead of Night of the Living Dead, the more intelligent talkers of Return of the Living Dead and the infected living of 28 Days Later. And for a bit of fun I threw in the clumsy but slightly intelligent vampires of Last Man on Earth.These were the prototype zombie that kick started it all.